The creative mind is a curious thing, filled with brilliant ideas but not always the conclusions to link them together. That's why writers, artists, and other imaginative minds are using Scapple to turn their loose thoughts into concrete action plans and goals. This software is available in the Boing Boing Store for $9.99. 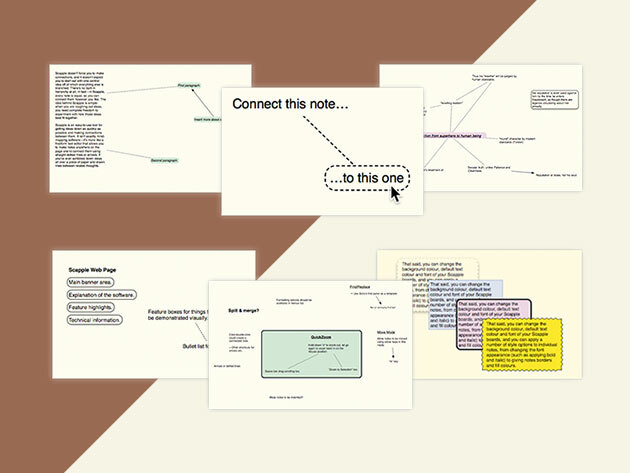 A freeform mind-mapping tool, Scapple lets you easily record and find connections between your ideas, whether you're working on a blog, narrative, tech project, or business venture. You can quickly jot down ideas to make sense of them, trace lines or arrows between related ideas, and better organize your thought clusters into actionable strategies. Plus, with the ability to share your projects, you can easily communicate your new strategies to family, friends, coworkers, and anyone else you plan on collaborating with. Scapple is available in the Boing Boing Store today for $9.99.